Hello and welcome back! This is my second day of guest designing at My Favorite Things Blog. I am sharing two more cards at the blog using Pure Innocence stamp sets. Here is one of the cards I shared today. I started with stamping and copic colouring the images from Pure Innocence Fun in the Sun stamp set. Then I hand cut them out as I don’t have the matching die. If you have the matching die, die cut the images using them. 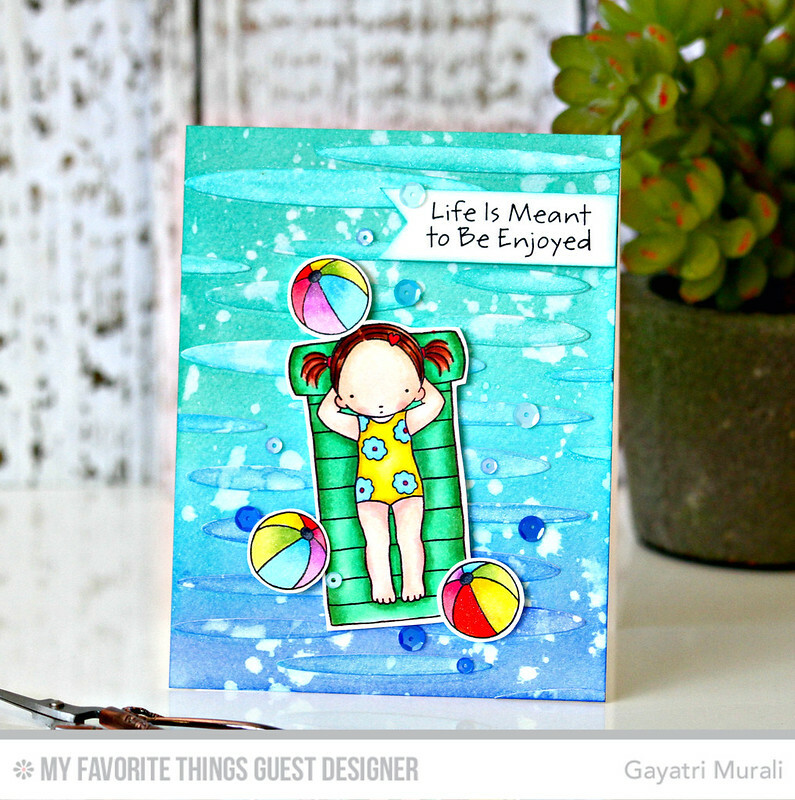 I used one of the flowers from the Sweet ForestFriends stamp set to stamp and add pattern to the girl’s bathers. For the background, I trimmed two Tim Holtz watercolor paper to the size of the card front. I sponged Peacock Feather, Evergreen Bough and Blueprint Sketch distress inks on both the watercolour papers. I spattered clean water on both of them and dabbed the water off with a cloth to get texture on the panels. One panel I adhered on a Smooth White card front. I ran the second panel into my die cut machine using the Oval Shadows die namics. I adhered these oval shadows randomly to achieve waves, extra dimension as well as texture to the card front. I brushed clear shimmer using Wink of Stella clear shimmer pen. I adhered the images from the Fun inthe Sun stamp set using foam adhesives. The sentiment is simply stamped on a strip of Smooth White cardstock, trimmed fishtail end and adhered. Finally embellished with Pretty Pink Posh Cobalt, Aquamarine and Ocean Spray sequins. Check out MFT Blog for the second card. Hope you like this one. Gorgeous Gayatri. Love those oval die waves. Oh my goodness, this is so precious!!! LOVE that background! And the colors are awesome!!! You achieved such a cool effect with the oval shadows dienamics!!! Cute as can be!! !